An interview with needlepoint studio, Stitch by Stitch Co-founder, Betty Scanlan. 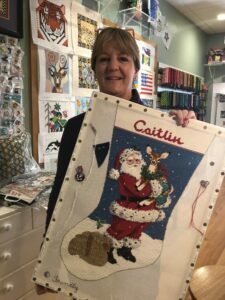 On November 1, 2018 I had the great pleasure of interviewing, Betty Scanlon at Stitch by Stitch, a needlepoint gallery in Larchmont, New York. Her story is fun, passionate and all things needlepoint! Does everyone in your family Needlepoint or just you? Yes! I have three sisters and we all needlepoint to some degree. I just needlepoint more than the rest of them. Sometimes I shamed them all into needlepointing something from time to time. My sister Karen probably does more than any of the other two but they all have finished pieces in their homes. How did you start Stitch by Stitch? And where did you get the name of your shop? There was a needlepoint shop in Larchmont for 30 years before us, but we wanted a fresh start. So we purchased her inventory, chose a new location and gave the shop a completely new name. The name, Stich by Stitch? My mother taught me how to needlepoint when I was a little girl at the age of 8 and she said to me a thousand times, “you will be finished Betty stitch by stitch”, and I never forgot it. My mother reminded me of this we when we getting the store set up and I strong-armed Madalena for this to be our name. How did you and Madalena meet and decide to open Stitch by Stitch? Madalena and I met through a church group. We sat on a committee together and I was the one that would be needlepointing in meetings and she asked, “what are you doing?” So I taught her how to needlepoint. Then we both worked part time at the first needlepoint shop here in Larchmont. Madalena had always done all kinds of other crafts but never needlepoint before meeting Betty. How did you transition from needlepointing in committee meetings to working in the needlepoint shop? The past Needlepoint shop owner asked me one day if I could help her because I just knew so much about needlepoint, so I started coming in after I dropped my children off at school. You mention that this is your passion, not just a hobby? What does that mean and how does that impact how your run this business? Some folks open needlepoint shops so that they can get their Needlepoint and fibers at cost. We are passionate to share our love of needlepoint with anyone and everyone we can. If you want to try something new or saw something you want us to order, we will find it for you. I think we had six lines of thread when we opened and now, I don’t think I can count the number. We are running out of space. Sometimes Needlepoint shops can feel snooty and not all that welcoming. That is not true when you walk in here. What are you guys doing that makes it so welcoming? I think the first thing we did when we literally opened (through the generosity of our parents) was furnish the front of the store with a community table, a chandelier and a china cabinet so you felt like you had just walked into someone’s home. People just love coming in here and feeling welcome. You can needlepoint at the front table anytime, no charge. The back table is reserved for classes and private lessons. We also have a ton of groups. Huge Saturday contingent, four women drive all the way here from Long Island every week! We also have studio time where for $20 you have access to at least one of our two teachers for a two hour session for help on your project. Anywhere from 1 to 7 people to be at the table, but it typically there are 6 people. We started with Tuesday morning and Wednesday morning and then we went Noon and Thursday morning and Saturday mornings. Very popular! We offer classes from nationally known teachers. Next year we are planning on three. In December we have Laura Taylor coming. She will doing beading and ribbon techniques for two full days. In January, Marina will be teaching a little Four seasons canvas where each window pane shows a different season of the tree outside. Maryellen is starting a beach scene, probably in January. Next summer we will do a cute pumpkin patch. Some classes are a few hours and some are over multiple days. Tony Minieri will be back next fall. Participants send us their canvas. We mailed them to Tony. He designs a personal stitch guide for each canvas and returns it with a thread list. When the class comes together, Tony will stand in front of everyone and shares what he recommends for each person’s canvas plus helps each person individually. He is fabulous. What else do you do that creates such a warm community of needlepointers? One of my favorites is we spotlight a “Stitcher-of-the-month” where our clients will bring in a few pieces they have done and we display it here behind the counter. They are famous for the month and it is typically very inspirational for others. Often their family will come in and be so proud of all the fine work their wife/mom have done. We have amazing customers in the sense that everybody shares everything! We actually have this gallery throughout the store where our clients loan us their work sometimes directly from the framer! Our clients will tell us that more people will see their work if it is hanging in our store than if it is hanging in their home and they love to share. Makes it fun and expands all our examples of inspiration! Like that Grinch pillow – I’m not even sure why I did it, but once it was finished and up on that shelf, we sold 10 of them! When people come into the shop and see everything finished they get inspired way beyond unfinished canvases alone hanging on the wall or in stacks in a basket. Two very popular pieces are the American flag and the Broadway show collaboration. Our customer Susan worked with one of our teachers, Marina, who selected the stitches and this turned out amazing! It was on display at a convention and now other stores across the country call us for the stitch guide. With all this amazing diversity of options, why do you think Needlepoint is not growing at the same pace as Knitting or Crochet? The expense of it. You can walk into a knitting store and get a ball or two of yarn for really cheap. However, when you walk in here you might find a beginners kit for as little as $25. Everything you need, but it can look very juvenile. Not only do you have to pay for the canvas and thread, but then you still have to get it finished. Why is needlepoint so much more expensive than other fiber art? Needlepoint canvases are literally hand painted so you know exactly where to stitch each color. You can get stamped canvases but then it isn’t clear where to stitch. It is just much more enjoyable to stitch something that is hand painted. Hand-painted canvases are designed by actual artists that are bringing these canvases to life. The diversity of designs in your needlepoint gallery is so broad. How do you know what your clients are going to want here in Larchmont? We go to two trade shows a year. One is in Dallas. Cash and Carry run by the companies that actually own the needlepoint canvases. It is held in the Embassy Suites where you literally walk into their hotel room set up as the front of their shop. It is like the ultimate Needlepoint Mall! It is a very personal way to do business vs a huge trade show. The second is usually in southern California like San Diego. This can be very overwhelming because it is also with Knitting. Thousands of vendors, so it is it’s a lot and you’re not getting the same personal attention like you do in Dallas. We also do trunk shows all year long. This is where you can see everything in a designers line, not just the few canvases we purchased at a show. The canvases are loan from designers with the shop for limited time, anywhere from 2 – 4 weeks and we offer a 20% discount. And you can buy the canvas right then, you don’t have to wait for it to be painted. Do you have customer’s ask you to find certain things when you go to Dallas or California? Yes, we take an entire wish list with us. Susan, who does all our social media, also posts on Pinterest boards each night when we are in Dallas. After visiting vendors during the day, we spend the night back in the room pricing canvases, reading all of our emails and prepping to going back to all the vendors the next day to purchase everything that Susan has posted and our customers commented on. We probably come home with a third of our suitcase filled with canvases that are already sold before we leave the show! How has social media changed your business over the past 14 years? I will say that social media is a mixed blessing. There’s no more excitement the way it used to be. You would go to the show in California and never brought anything home right away, except that one time when we bullied that one lady. We weren’t even able to take pictures. You put in your order and ask for it to be split shipped. Half in six weeks and the other half at a later day. So then, the UPS man pulls in and we would say, “Santa had arrived!” Everyone would hover over us opening the boxes to see what had come in, because we didn’t know what would be in the first half vs. second half of the split shipment. In addition to the explosion of stitches, there are also so many more thread choices now. How is this changing what needlepointers are making? I equate Needlepoint to comfort food and especially after 9/11 folks were staying home more, doing needlepoint on the sofa at night. The more they were sewing they started incorporating stitches we learned from cruel as children. And we have these wonderful teachers who teach depth perspective and shading. It’s such fun… We just completed a class with world renowned teacher, Tony Minieri. You look at the detail he gave each student for their individual projects. Its ever growing what people are doing on their canvases. It has to be or needlepoint is going to die. Not many people are satisfied to use the basket weave stitch alone anymore. Plus there are so many new thread choices! We have women that are in their 60s and 70s now getting into trying new stitches and always yearning to learn something new. The breadth of new fibers alone is expansive. You can now use velvet, patent leather, metallics, sparkly beads and fuzzy fake fur. One of our gals, is 89 and has been needlepointing with us since the old store. She came in one day and we moved her from the front table to the back of the store with the teachers and she has transformed her skills. We have customers take needlepoint to all kinds of levels. 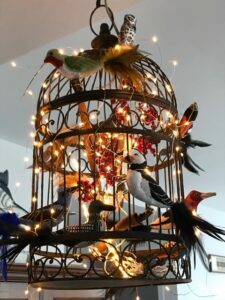 One favorite is how a client needlepointed nine three-dimensional birds and had them finished in a real antique bird cage! We were all blown away. Another client needlepointed a giant toy chest for her twins. Or check out this Christmas tree where every single angel is the same pattern, but the stitch choice and yarns are all different so no two angels looks the same! You also mentioned finishing. How has that changed? We do have amazing finishers. They do very unusual things and are gifted in their own medium as well. These trays are all hand painted and set the needlepoint out to really stand out in an unusual going way beyond a simple, knife edge pillow. People just need to have their eyes opened to all the new ways needlepoint can be finished such as three dimensional boxes and animals. Christmas star tree toppers. Handbags that mimic Channel bags. The other thing that sets Betty’s shop apart is the amount of personalization they give their customers. 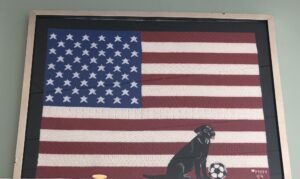 One client wanted to participate in an American Flag project, but she was 90 years old and she just couldn’t do 247 stitches, so Betty and her crew designed a flag canvas around their clients favorite 13 stitches plus added her grand-dog Otter who was rescued from the first bombing of the twin towers. She made it for her grandson, and it is on loan here until he wants it back. They are always thinking about new ideas. 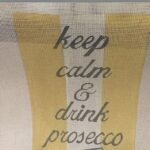 This January they will be doing a Prosecco and cheese night. Everyone will learn three new stitches to sew on this cute canvas. Just a fun girls night out.